Each year more than 10,000 people need bone marrow transplants to save their lives, and if a member of their family is not a match, then those patients' futures literally depend on the kindness of strangers. Selfless people willing to donate marrow to anyone who needs it. That is exactly what happened in the inspirational story of little Matthew Welling. Early Show correspondent Debbye Turner Bell has the amazing details. In 2004, the birth of little Matthew was an answer to Mike and Susie Welling's prayers. At the time, they did not know that Matthew was born with a life-threatening disease. A bone marrow transplant was his only hope for survival. The Welling's family and friends rallied around to give them love and support but it took two strangers to give Matthew the gift of life. Matthew Welling took his first steps here at New York's Memorial Sloan Kettering hospital. 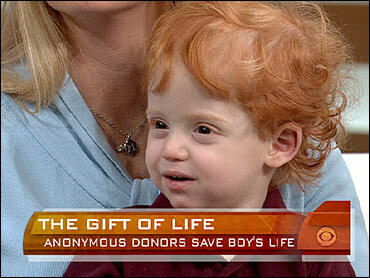 This little boy with the reddest hair and biggest heart knows what it's like to fight for his life. Just before Matthew's first birthday, Michael and Susie Welling got the news no parent wants to hear. "We had a full body x-ray and on our ride home he called us to say it's osteopetrosis," Michael Welling said. This rare and potentially fatal bone disease meant they were in a race against the clock. Their only hope -- a bone marrow transplant. Without it Matthew would be blind and deaf within weeks. "It was, here is our chance to make him normal, better," Susie Welling said. "He's gonna survive," Michael added. "He's gonna be OK," Susie said. They kept a Web journal, a daily lifeline for friends and family. "Tuesday, November 21," Susie Welling said, reading from the journal. "Our Day 2 -- Eight days until transplant. Good day for Matthew today." Would they be able to find a bone marrow donor whose tissue type matched Matthew's? "The odds of you knowing someone who is a perfect match are astronomical," Michael Welling said. Those are called divine odds. Fifteen years earlier Steven Karas registered as a bone marrow donor at his synagogue in Natick, Mass. "They called my office, my home, my cell phone and sent me an email all within seconds," Karas said. He was a perfect match. "I sell insurance for a living," Karas said. "To be able to go out and save someone's life is phenomenal." Within days Karas' blood stem cells were sent to New York. "Wednesday, November 29th. At 7:52pm Bubba received his new stem cells!!!!" was Susie Welling's journal entry. But Karas had no idea if his gift worked, or the identity of the recipient. Bone marrow donors must remain anonymous for at least a year. "Matthew was given this gift of life by someone we don't even know," Susie said. But that joy would be short lived. "Wednesday, December 20th," Michael reads. "This was the journal entry we did not want to have to compose. Matthew's body has rejected the transplant." Next came the harrowing search for another donor and sleepless, feverish nights for Matthew as his blood count dwindled. "This was the endless plunge," Michael said. "This was you just were freefalling. You didn't know how to stop it. You didn't know when it was gonna stop." And then another miracle. When Jill Goldsmith's phone rang in Boca Raton, Fla., the screen on her caller ID said "Gift of Life." "And at that minute it hit me. This was not about me and what I was doing," Goldsmith said. "This was about this little boy that was waiting for me in that hospital." Goldsmith became anonymous donor No. 2. "Saturday, January 27th," Michael reads from the journal. "11:25: Bubba's new life began!" But the battle wasn't over yet. Matthew developed a painful rash, a life-threatening sign the transplant was attacking his body. "Monday, March 5th," Susie reads. "We get no breaks. All the prayers in the world aren't working for us. Everything that could go wrong is ... "
Five weeks later … a ray of light. "Monday, April 9th," Michael reads. "We interrupt your regularly scheduled program to bring you this breaking news story ... BUBBA HAS LEFT THE BUILDING!" "That was a big day," Michael said. As the months passed, Goldsmith and Karas approached the one year anniversary of giving their gift of life. "Sunday, January 27th," Susie reads. "Today we met Steve - Donor No. 1." "My hopes are to watch him grow up and to be a fine, wonderfully responsible young man," Karas said. "I know that we will have a bond for life." "Saturday, May 17th," Michael reads. "It is our honor and our pleasure to proudly welcome into our family - the other half of Matthew's 'Dynamic duo' - Jill Goldsmith." "I changed so many people's lives and most of all -- my own," Goldsmith said. "It's really unbelievable that there is this world of good people out there willing to do such an amazing thing for others," Susie said. This whole story is possible because Steve Karas and Jill Goldsmith registered with the National Marrow Donor Program. And that's what they and the Wellings want everyone to remember -- how important it is for healthy, willing adults to register. You literally could give the gift of life. As for Matthew, he is thriving and growing, thanks to Jill and Steve.